And it's a wrap, folks! We're taking a much needed break. See you on the 31st. If you love the idea of having a Christmas centerpiece but don’t feel confident enough to try an elaborate design, then this cinnamon and fresh roses ‘cake’ is the option for you. Do give it a go with the easy to follow step-by-step guide in the article. Big blooming thanks to the editorial team from Haven for featuring our design! Pick-up a copy of The Edge (weekly edition) for a free December issue of Haven. Your Floristas will be taking an extended Christmas break to celebrate with our families. Last batch of orders will be delivered on December 21 and the store will be closed from Dec 22 - 30th. We reopen on December 31st. Thank you for letting us be part of your lives throughout the year. We are blessed. P/s: Featured in the photo is FeiFei, our multi-talented door greeter in his seasonal attire! We've put together a range of Yuletide blooms to celebrate the season! Alongside our most popular selections, we've also added some new designs to the range. Accented with pinecones, cinnamon sticks and seasonal trimmings, they will bring much joy whether it's for your home or as a celebratory gift. Potted poinsettia. Brighten any room with this colourful, Yuletide favorite! Our version is presented in a coconut fibre basket with a mini wreath and baubles. Tropical Christmas! Bright and bushy fir leaves are paired up with Conca D'or lillies, crab claws and plump football chrysanthemums, accented with seasonal trimmings. Cinnamon sticks, pinecones and all things Christmas in this basket filled with burgundy roses, red gerberas, crimson carnations, red-tipped berries and fir. Keepsake tin packed with lilies, roses, carnations, ferns, baubles and Christmas trimmings. Tis' the season! White lilies, eustomas and ilex berries sit side by side in this gold twigs and pinecones crusted basket. A hit as a gift! Birds of paradise, conca d'or lilies, roses, eustomas and berries; make it extra special with a bottle of wine. song of jamaica, monstera, bird's nest, eucalyptus and bear grass. We've been enjoying cool, wet and overcast days here in Kuala Lumpur and it's been a welcomed respite from the heat. Mr. & Mrs. Yong (together with their talented children) celebrated their 30th wedding anniversary. What an evening it was, packed with stunning performances, thoughtful speeches, scrumptious dinner and merry making! The theme was maroon and pearl - a gorgeous and fitting match for this anniversary. The floating pearls at the base of the vase added a nice finish. The candles on the flower stands cast a magical glow around the room when they were lit up. The tall candelabras with an understated touch of flowing stands of pearls. Smaller floral candelabras were placed on top of these handsome pillars which featured swirling organic designs. Part of the floral composition for the stage. The main table centrepiece juxtaposed against the awesome custom designed logo for the event. The main table where all accents were delicately put together and customised for this dinner. Close-up of the detailing on the main table. Another shot of the main table. The deep hues of these maroon roses stood out against the white and green blooms and the glow of the candle light. Sublime when the house lights came down. Mr Yong presented his lovely wife with a bespoke bouquet of her favoured madonna lilies. The handle featured whimsical pearl beading. We had heaps of fun at every stage leading up to the event and even more during! Thank you for letting us play a a part in creating this wonderful setting. Congratulations Mr & Mrs. Yong! Forget impersonal floral stands. Make a statement! Flowers to impress clients? Impersonal stands left on outdoor walkways are a thing of the past! Make a statement with this tall congratulatory arrangement featuring a lush tropical composition of crab claws, golden ramsy orchids, white dendrobium orchids, eustomas and green ping pong mums alongside curly willow braches and heaps of leaves in various green hues. At 5 feet tall it definitely is a statement piece! Or if space is an issue, then how about this 2.5 feet tall composition of yellow roses, crab claws, AJ storey orchids and cymbidium orchids. The recipients of this vase were thrilled which means the client who commissioned it was more than happy with us. Smiles all round! Do pick up a copy of the Aug-Sept issue of Haven (comes with The Edge weekly) to see how you can recreate this stunning tropical piece with an easy guide by Nook Flowers. Floral arrangements in vases are always a classic choice. Whether it’s a tall piece for the entryway or something more compact for the coffee table, we’ve always had a natural preference for vase-based designs. Plus, there’s no need to use floral foam and just fill up with clean water (but remember to change it often and wash your vase out with soap when the flowers have wilted – it’s shocking how many folks don’t do this!). Presented in a clear tubular vase, this composition stands at almost 2 feet tall and features lilies, tuberoses, eustomas and curly willows sitting among lush greenery. Perfect for a man’s abode, here’s a design with crab claws and green anthuriums with swirly, marble-like white shading. All the shades of summer can be found in this arrangement featuring gerberas, carnations and cymbidium orchids. We sent off a whole bunch of these pastel hued beauties composed of eustomas, hydrangaes, mums, alstromerias and ivy for a wedding at the Carcosa Seri Negara recently. ST just moved into the neighbourhood and wanted a house warming arrangement that worked for her new pad. So we put together this composition of white lilies, champagne and white eustomas, purple carnations, salix with little sprouting shoot (like!) all nestled in some multi-green hued leaves. As a bonus, Stephen Chong (www.rollofexposures.com) spent the day in the flower shop taking photos of us going about our work. Stephen was so quiet and stealth-like, we forgot he was even there but he says it makes for better photos! The slideshow of his day at Nook can be found at Kizoa slideshow - Nook Flowers. Personal fave was from Doggy Bag Malaysia. "Thank you Nook! 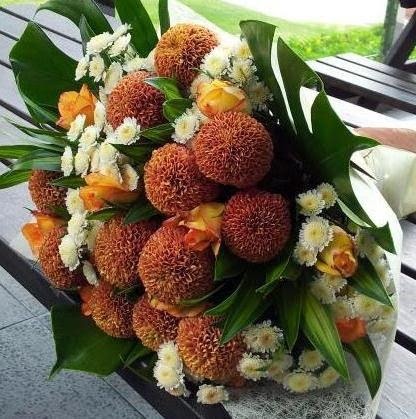 Your wonderful bouquet of flowers arrived yesterday and as you can see...it is enjoyed by all! Ziggy gives Nook a big nose up!" To those of you who walked-in that day, you would have been cheerily served by the oh-so-sweet Farah Diyanah who (happily for us) was back in Malaysia for her hols and chose to spend the day amongst the blooms. Here’s her account of A Day as a Nooklet. Farah leaves for Melbourne in a few days and we are sending her off with thoughts of gratitude and much, much affection. It was joy having you with us, kiddo and you made us all smile (even Brenda who can be hyper-serious when in work mode) J. To our customers (repeat and first timers), Valentine's Day or not, we're grateful to have you in our lives. For one who appreciates flowers with a difference – this rustic wooden watering can is filled to the brim with locally grown cymbidum orchids, roses and daisies. When she says, "This Valentine's Day you don't need to do anything special for me, honey," are you going to fall for it? Happy 200th birthday Mr. Dickens! Labels: Charles Dickens, Did you know? Hey folks! Early bird price for Valentine's Day ends today. Don't miss out! Call us at +6014 368 1044 to place your orders. Stumped for words, try this? 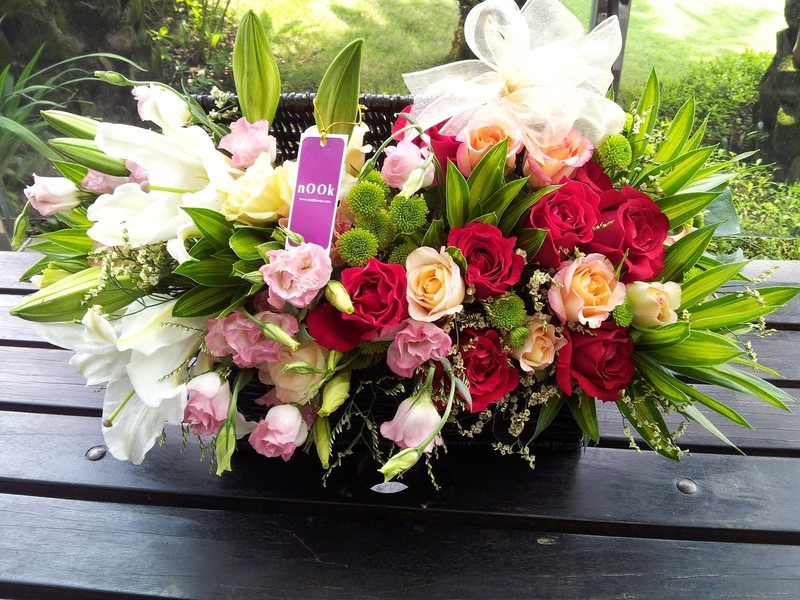 Option: Add RM25.00 for an arrangement in a clear glass vase. First time in Malaysia & exclusive to Nook Flowers - indulgent chocolates from Belgian Master Chocolatier Pierre Ledent! Air flown, these hand-packed ballotins and luxury chocolate boxes are sent directly from the Pierre Ledent flagship store in Belgium. Introductory Valentine's Day prices and packages available. *Normal delivery hours are from 10am-5pm. *Valentine’s Day delivery is subject to our delivery’s schedule. To ensure you get the best of our service & due to the popularity of Valentine’s Day , please order at least 3 days ahead of intended delivery date. Gorgeous shade of pink lilies and baby’s breath. Large bouquet of two dozen pink roses and eustomas. Classic bouquet of dozen red roses with baby’s breath. Bouquet of red and white roses, tea leaves and hypericum berries. Purple gerberas nestled among green song of Jamaica shoots and sprigs of peacock. Bouquet of sunflowers, berries, purple statice and white peacock. Mix-bouquet of red and pink roses, purple statice and green kermit buttons. Mix-bouquet of white lilies, pink gerberas, purple buttons, statice and two-toned 'disco' pink roses... yes disco!